In the early 1990s, a new software company was founded in Germany. It was called Kaiko and sported Chris Hülsbeck, the composer of many great and memorable game soundtracks (including those of the Turrican games), as its most famous member. Kaiko set out on a mission which was very unusual for a European company, at least at that time: To give their software the special look and feel only games of Japanese origin used to have. Remember that this happened at a time when anime-style graphics were virtually unknown in the west and were just starting to gain a little popularity among those who imported games for their Mega Drives and PC-Engines. Kaiko succeeded well in accomplishing their task. If you wouldn't know better, you'd bet that the three official Kaiko releases (the cute puzzlers "Gem'X" and "Super Gem'Z" and, of course, the shmup "Apidya") were conversions of japanese arcade games. Only they weren't. They all were original developments. This being shmups.com, Apidya naturally interests us the most, so let's talk about it a bit. First a few words on the title screen. In addition to the game's name we can see a big "II" there. This has caused quite a lot of confusion back in the day. Rumours went that Apidya was actually the sequel to a mysterious unknown Japanese shooter. Well, to stop those rumours once and for all: According to an interview with Mr. Hülsbeck, the purpose of putting in the "II" was to actually cause that kind of confusion. 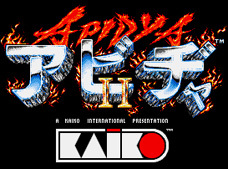 This game is not called "Apidya II", nor is there a predecessor. Sadly, Apidya is the only one of its kind. But what a game it is. It's really on par with any of the best Japanese shmups of that time and shows what amazing stuff you could do when you knew how to use the Amiga's abilities properly. The story of Apidya is a bit odd. It's some weird stuff about an evil mage wreaking havoc and a valiant young man setting out to avenge his seriously injured girlfriend. All that matters is that it sort of explains why you don't control a spaceship in this game, but a wasp. Yes, a wasp. Apidya is all insect-themed. Be it the player character, the enemies or the beautiful set pieces, everything is made to resemble the microcosm of a world seen through insect eyes. Apart from its strange theme, Apidya is pretty much your typical Gradius-style sidescroller. It even borrows the weapon powerup system of the Gradius games. Certain formations or single enemies, after being shot, leave behind small red flower symbols. Collect one of those and the highlighted box on the powerup bar at the bottom of the screen moves one step to the right. If you want to activate the currently highlighted extra, you've got to press the space bar. In addition to the usual speedups (and speed-downs, in case you accidently got to fast) and shields, you can get two types of missiles (between which you can switch by selecting the same extra again), up to two little helper bees (that act like the multiples from Gradius) and one of three main shot enhancements. For your main weapon you have the choice between spread, lightning and plasma. Spread is pretty much self-explanatory. It has great coverage, but is relatively weak. The exact opposite is the plasma shot, which looks like an incredibly cool variation on the spiral laser from R-Type. Plasma is very powerful, but it's slow firing rate makes it somewhat difficult to use. A good compromise between spread and plasma is the lightning shot. It's average in power, coverage and shot frequency, but it's suitable for most situations. Each of the shot types can be powered up several times by selecting the same extra more than once, but you can only have one of the three types at a time. In addition to this there's one secondary weapon you don't have to collect or power up: Holding down the firebutton for a few seconds and then releasing it fires a super sting, Apidya's equivalent of R-Type's charge beam. There are five long stages in Apidya altogether, the first three of which are divided into three substages each. Each substage has its own evil midboss. Stage four consists of only two substages and stage five is a boss-rush stage. There are four secret bonus levels that can be accessed by performing special tasks at certain points in the game. The level design is spot-on, making the playability of Apidya really great. The game is very challenging, but never cheap or unfair and the controls are smooth and responsive. A useful addition (and very unusual for a homecomputer game of that time) is the console-style options menu that allows you to listen to all those excellent Hülsbeck tracks and to configure the game to suit your needs. The best option is to set the controls to 'Sega'. This allows you to plug a controller from your Master System or Mega Drive into your Amiga. Now you can use the second button for activating powerups, so you don't have to move your hand away from your stick in order to reach for the spacebar anymore. This is a great idea more Amiga games should have adopted. There's a 2P mode in wich the second player controls an invulnerable little helper bee, but it's really nothing to get excited about. It's a half-hearted effort and incredibly boring for the second player, whilst at the same time not as helpful for the main player as it should be. The graphics are colourful and excellently painted, putting ashame even later games like Thunderforce IV. Additionally, they are very unique in style. The music is, without a doubt, Mr. Hülsbecks greatest work outside of a Turrican game and is likewise wonderful. Each stage has its own theme song, but in each of the substages you get to hear a differently arranged version of it. Well, all that greatness in the audiovisual department would mean nothing if the gameplay was crap. Fortunately, the exact opposite is the case. Apidya is the single best shmup ever released for the Amiga platform. It's a delight to play and remains fresh and highly enjoyable even to this day. Additionally, it contains some of the best boss fights I ever had the pleasure to play through. If Apidya had seen some more exposure (through ports to other systems) to the shmupping crowd, it would have claimed its rightful place among the classics. A big thank you to Shatterhand and Codyjarret for providing the screenshots. This caterpillar is actually the first midboss. It sends quite a lot of bullets, if you consider how early in the game it is. After you kill it, a little fat angel will rise from its dead body. Catch it to access a secret bonus stage. This is the aforementioned bonus stage. It's one of four that are hidden at special places throughout the levels. Catch the angels for points and avoid hitting the devils. If you do hit one of them, you don't lose a life, but the bonus stage ends immediately. Back to the normal level again. This is the second midboss. Don't let the mole fool you with his cute looks. He's evil. If you fly into the mole's hill after you killed him, you access the second bonus stage of the game. In this one you have to avoid hitting the walls and collect as many of the flower/star symbols as possible. I don't want to show you only bosses and bonus stages, so here's a shot of how the game looks like during the normal course of the stage. The explosion to the right was a huge spider just a second earlier. Boss time: The praying mantis is the final guardian of scene one. It's relatively easy to beat. Just stay away from its arms. Stage two is horizontally divided into two playing areas. It's up to you to decide if you want to stay above the water and fight swarms of mosquitos or stay below and fight colourful fish. You didn't really think that there wouldn't be a snake in Apidya, did you? Well, this one is quite nasty, as it moves really fast and you have only limited space to maneuvre. This is the second midboss of scene 2. It's a lot easier than the first one. This boss is actually three screens wide and you have to circle him several times to finally dispatch him. Definitely one of the most memorable bossfights of my whole shmupping life. Hidden inside the big fish's mouth is the third bonus stage of the game. It plays very much like the second one. Collect the Coke cans for points and avoid crashing into the fishbones. Scene 3 takes place in the sewers. Avoid the smoke from the cigarettes. If you happen to touch it, the whole screen is flipped vertically for a couple of seconds. In Apidya, smoking can kill you, literally. ...Then its chest bursts open and out come the maggots who immediately flood the screen with bullets. No, your screen isn't damaged. This is a picture of the fourth bonus stage, which can be accessed by boldly diving into the dead rat's guts after killing the maggots. Different layers of disgusting stuff scroll in weird directions and make it difficult not to hit the walls in this speed scene. This bonus stage is more sickness-inducing than stage 5 of Gynoug. It's amazing how much love and work went into the details of this game. In the sewers we even meet the Steadfast Tin Soldier from the story by Hans Christian Andersen. However, the ballet dancer is nowhere to be seen. After finishing off the soldier, we have to cope with this bottle of deadly liquid. Beware of the green slime, too. It slows our battle wasp down and is virtually everywhre in this level. This is the second miniboss. A deadly Coke can. And this castaway rag doll is the final boss of scene 3. Be careful, as it has many tricks and attacks up its torn sleeve. As we enter scene 4, our battle wasp is transformed into a metal wasp. The music switches from the melodic style of the previous stages to some kind of hard techno beat, which perfectly supports the atmosphere. These electricity cages appear at several points during the stage. They can't kill you, but sometimes you are forced to enter one and if you don't get out of it again in time, it might push you right nto the next wall. Does this midboss ring a bell? You can't kill him, actually, so just try to survive until he goes away. At least you can say that the creators of Apidya have a decent taste in videogames. As you can see, the whole scene 4 is an homage to R-Type, which becomes more and more apparent as the stage continues. And this is the final boss of scene 4. Quite a tricky one he is and things are getting a bit hectic. The actual boss is the little flying red pod with the rotating shield, but it's the support he gets from his bigger brother with his huge laser cannon that makes things difficult here. Stage 5 is a boss-rush stage. You fight five bosses in a row and there are only a few popcorn enemies in the level parts between them, whose whole purpose is to give you the opportunity to power up again in case you lost your weapons to one of the bosses. The first boss is a pufferfish. Similar to the one found in Parodius Da!, this fellow is very small and laughable first, but he grows with every single hit. His attacks grow also wider as his size increases. Finally, the fish splits into three and things are getting particularly nasty. The second boss is a giant bat. It moves in unpredictable patterns and its large wingspan is dangerous. Be careful not to get hit. This agressive shell is the third boss of the final stage. It's actually one of the easier ones. If you made it here, you shouldn't have too much of a problem beating it. This boss reminds me a lot of the midboss in stage 4 of Gynoug. He's extremely dangerous. He spits out lots of spiderwebs and sends little spiders that crawl all around the screen. And this is it. The great finale. 'Pachi fans should feel immediately at home. The boss hornet puts up quite a fight. It sends streams of little hornets against you and attacks mercilessly. Good luck.